Our spring program begins in May! Are you thinking about a healthier lifestyle but just don’t know where to start? Maybe you’ve been to “Lunch & Learn” in the past and are looking to join us again for a “refresh and reboot” to get you back on track? 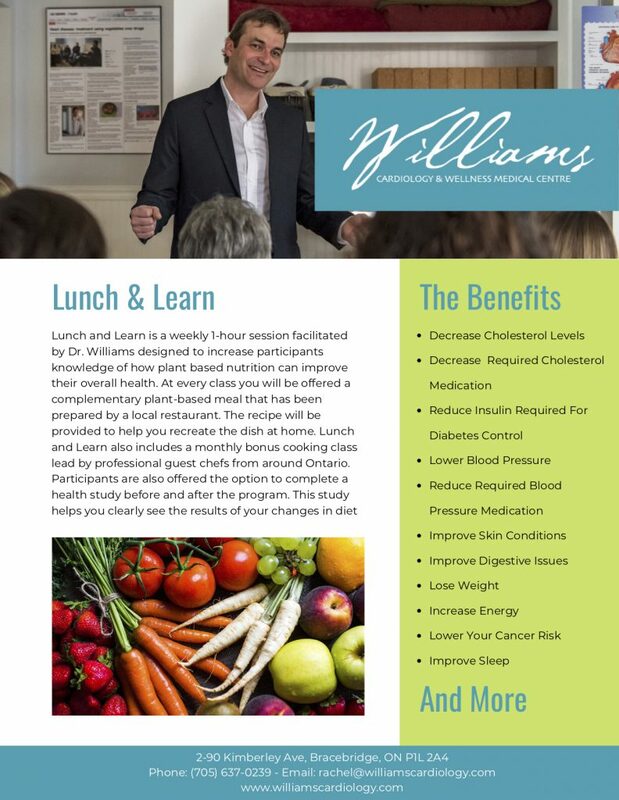 At our weekly hour-long session, Dr. Shane Williams offers an interactive presentation on the science behind heart-healthy plant-based eating, current health topics and a question & answer period. The program also includes bonus Cooking Demonstrations that take place at the Independent Grocer in Bracebridge. A local chef or guest chef from the Greater Toronto Area will prepare 4-5 recipes and you get to sample each one! All this at no charge to you! We offer afternoon and 4pm classes to fit your day! There are limited spots and registration is required! Please call (705) 637-0239 or fill in our contact form here.